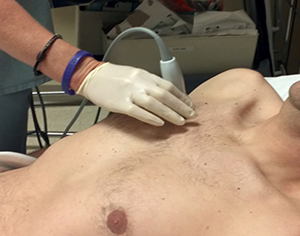 SONOSIM SUMMARY: This retrospective study from the American Journal of Emergency Medicine aimed to identify an optimal ultrasound probe location for diagnosing traumatic pneumothoraces. When scanning regions between the fifth and eighth intercostal spaces, ultrasonography was 80 to 84% sensitive for detecting pneumothoraces. Current e-FAST protocol typically involves scanning only the region between the second to fourth anterior intercostal spaces. The authors conclude that modifying standard protocols for pneumothorax screenings to include these regions would be beneficial for making the diagnosis. We sought to assess the anatomical distribution of traumatic pneumothoraces (PTXs) on chest computed tomography (CT) to develop an optimized protocol for PTX screening with ultrasound in the emergency department (ED). We performed a retrospective review of all chest CTs performed in one ED between January 2005 and December 2008 according to presence, location, and size of PTX. Pneumothoraces were then measured and categorized into 14 anatomical regions for each hemithorax. A total of 277 (3.8%) PTXs were identified, with 26 bilateral PTX, on 3636 chest CTs performed during the study period. Etiology was blunt (85%) or penetrating trauma (15%). Eighty-three (45%) PTXs were radiographically occult on initial chest x-ray. One hundred eighty-three (66%) PTX had no chest tube at the time of CT. For both hemithoraces, the distribution demonstrated increasing PTX frequency and size from lateral to medial and from superior to inferior. Region 12 (parasternal, intercostal spaces [ICS] 7-8) was involved in 68% of PTX on either side; region 9 (parasternal, ICS 5-6), in 67% on the left and in 52% on the right; and region 11 (lateral to midclavicular line, ICS 7-8), in 46% on the left and in 53% on the right. The largest anterior-to-posterior PTX dimension was seen in region 12. Our results indicate that 80.4% of right- and 83.7% of left-sided traumatic PTXs would be identified by scanning regions 9, 11, and 12. These findings suggest that a standardized protocol for PTX screening with ultrasound should include these regions. To read the complete article, visit The American Journal of Emergency Medicine by clicking here.